A telephone pole in Victoria's Fernwood neighbourhood gets the artistic treatment. Photo from Fernwood NRG. The telephone pole in front of Beth Threlfall’s house bugged her. Beyond the banal nature of an ordinary wooden pole, this one had been targeted. An anonymous tagger had spray-painted a symbol on the pole. It was a glyph indecipherable to all but the tagger and, perhaps, those with whom he shared his exploits. Like a dog marking territory, the tagger’s mark could be found throughout the neighbourhood. The tags also gave the streets a menacing air — a vandal was working freely under cover of darkness. Ms. Threlfall walked home from the talk, feeling inspired and wondering what she might do to make her neighbourhood more vibrant. The 40-year-old stay-at-home mother of two, who is a self-taught artist, decided she should simply paint over the tagged base of the telephone pole. 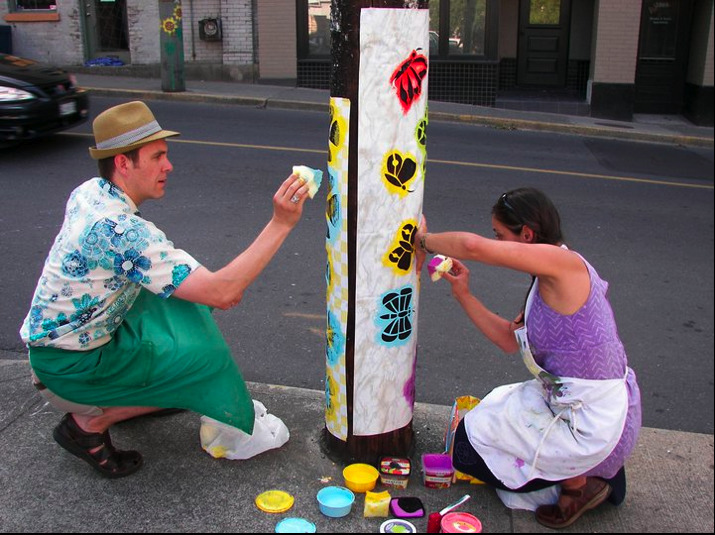 Soon, she began painting a pole on Fernwood Road. It is a narrow street with houses close to the sidewalk. The speed limit is 30 km/h. The act of painting street furniture made her a spectacle. Her rendition of sunflowers, though no Van Gogh, was appreciated. Some asked her to do their pole next. Soon, every pole in the 1600-block of Fernwood had been decorated. Art work began to sprout on poles on the surrounding streets. Others asked just for a plain coat of paint. She called her project Adopt-A-Pole. Centered around the city’s oldest high school and a church transformed into a theatre, the neighbourhood feels like a village. It is often called funky, a description locals loathe. Outsiders teasingly refer to it as the People’s Republic of Fernwood. A free barbecue lunch was cooked. One hundred and one poles were identified for a paint job. About 300 volunteers showed up. By the end of the day, the streets were decorated by poles sporting cattails in marshy browns and dandelions in glorious yellows; doves and cranes in brilliant whites; jumping frogs in whimsical greens; dragonflies with red bodies and green wings. A perambulation along the streets offers displays of shocking pinks and funky purples; dashing reds and mundane greys; primitive caricatures and a spectacular Betty Boop, on a pole one block south of Vic High. At the risk of being a snob, it must be said the art on some poles is more — er, um, successful — than others. Angela Hemming, a blogger and digital media producer, took part in the paint-in, which she praised for contributing to the hood’s artsy vibe. She felt for those homeowners whose poles decorated by what she called “kiddie-splatter,” noting at least one such pole had been repainted a dignified grey by nightfall. There have been other critics. The students at the local George Jay Elementary worked with Ms. Threlfall in painting the poles surrounding the school. A neighbour so disliked one immigrant child’s rendition of the Mexican Day of the Dead, featuring dancing skeletons with flowered top hats, that she defaced his work by splattering paint over it. Ms. Threlfall’s renewal project has given her insight into the mentality of the tagger. “It became an addiction,” she said of her own pole painting. “You start and it becomes a compulsion. You think, ‘That corner would look so much better if it had a flower on it.’ You see this space and you need to fill it. The difference is that taggers never ask permission.